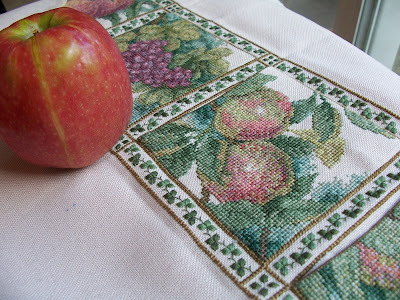 The old, old saying "an apple a day keeps the doctor away" has a grain of truth to it, and for me, that's also true for stitching. So even though I've been busy with other things, I have not been neglecting the stitching entirely, even if it's just to put another length of thread into the border of my Grandmother's Christmas gift. Truthfully, working on this piece sometimes feels more like a chore, because the materials are not what I prefer to use and I do not enjoy stitching borders. 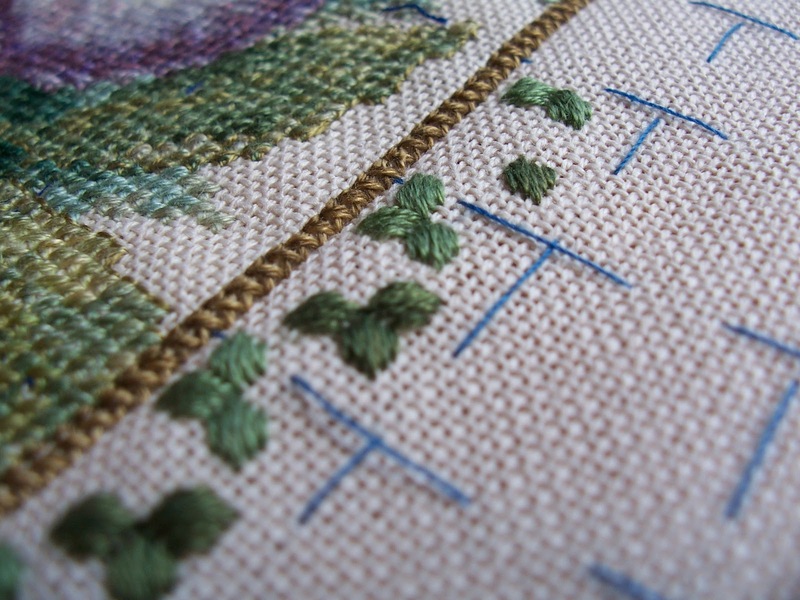 I do love the finished effect of the pretty satin-stitch leaves, though! This is "Floral Bellpull" by Theresa Wentzler and is one of those projects that looks better when you can stand back a way, rather than close up. Grandma stitched all the fruit panels several years ago-- she can no longer stitch so asked me to complete the boder and finish bellpull with the panels as individual pockets. 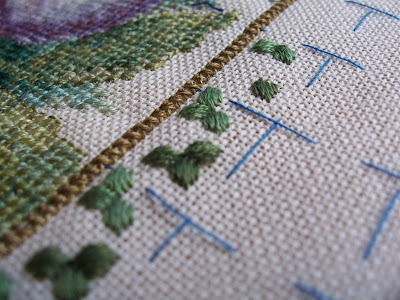 It has taken me longer than it should have, unfortunately, but now that I only have one more of the panels to stitch on and the border is nearing completion, I find myself moving faster on it because I can see the finish line.